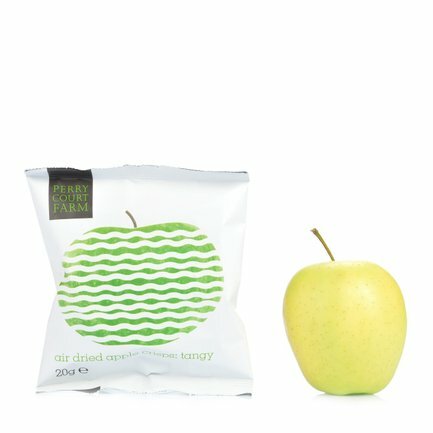 The Tangy Apple Crisps from Perry Court Farm are crispy apple slices made from the fruit grown in Kent, picked and prepared by hand. These completely natural apple crisps are distinguished by a pleasant crunchiness and a slightly sharp note, characteristic of fresh fruit. Made only of thin dried apple slices, this snack is ideal for a tasty break even for those who follow a vegetarian diet or have to keep down their calorie intake. Perry Court Farm is a small company located in Stour Valley, in the heart of the English countryside, surrounded by the orchards and fields that grow the ingredients that characterise the company's optimal products. Perry Court Farm has been growing fruits and vegetables for three generations, with full respect for the environment. The traditional cultivation methods, in combination with the technologies for sustainable agriculture, make it possible to obtain truly healthy products that are distributed directly to consumers or processed according to artisan methods for obtaining delicious and light snacks that are able to satisfy your craving for something good with genuine ingredients.